The Gluten Free Maven: Thanks a Lox! So there are some things in cooking you try to make at home because you're adventurous and because you want to see if you can actually do it and have it come out right. Choux pastry, macarons and cured fish would be in this category. From a most unlikely source I was inspired to make lox at home. I recalled from my adolescence that my mother made gravlax from scratch once, presumably inspired by the same spirit of adventure as me. I recall it involved putting the salmon in vodka and turning it daily for almost a week. As a child, I recall wondering why this dish was taking so long to be ready! But the recipe I came across only takes 2-3 days. While flipping through a really great Thai cookbook (Thai Food and Cooking by Judy Bastyra and Becky Johnson), I saw a picture of something that looked like the lox I've been eating on my Sunday bagel my whole life. I always thought of this iconic pickled salmon dish as a Jewish, Russian and Scandinavian specialty. So it turns out, it's not actually part of Thai cuisine, but the authors used traditional Thai spices such as lemongrass, red chili and kaffir lime leaves to make a Thai inspired version of "Gravadlax". As it turns out, on the snowy day I decided to make this dish, I did not happen to have lemongrass or kaffir lime leaves in the house. But I did have some of the other items, and combined them with my knowledge of the traditional gravlax flavor profile. When the dish actually turned out o.k., and looked decidedly "loxy" to boot, it was sort of a like doing a cartwheel for the first time and feeling surprised you landed on your feet---then throwing up your hands in triumph. This version differs from traditional gravlax, in that it only utilizes a dry rub, and no liquid in the form of vodka or Aquavit is added. As the dish sits for several days, liquid from the fish leeches out into the dish. The preparation takes just about 15 minutes, and then you have to commit to flipping the fish over once a day for 2-3 days (I suggest 3). So, although from a distance making lox at home seems daunting, it's really quite easy. And, quite economical. You should absolutely use fresh fish, but even so, fresh salmon costs about half that per pound of store bought smoked salmon or lox (if you want to know the difference between these two click on this link). The spices are all pantry staples, and I estimate cost less than a dollar total. Remember to use a non-reactive container like Pyrex or ceramic for this dish, as it contains acidic ingredients that can react with metal over the several days it is curing. Rinse and pat dry salmon. Run your fingertips over the salmon and pull out any bones with a pair of pliers. Place in a non reactive baking dish. In a small bowl, combine remaining ingredients except bay leaves. Rub spice mixture evenly over both sides of the salmon. Place bay leaves in baking dish. 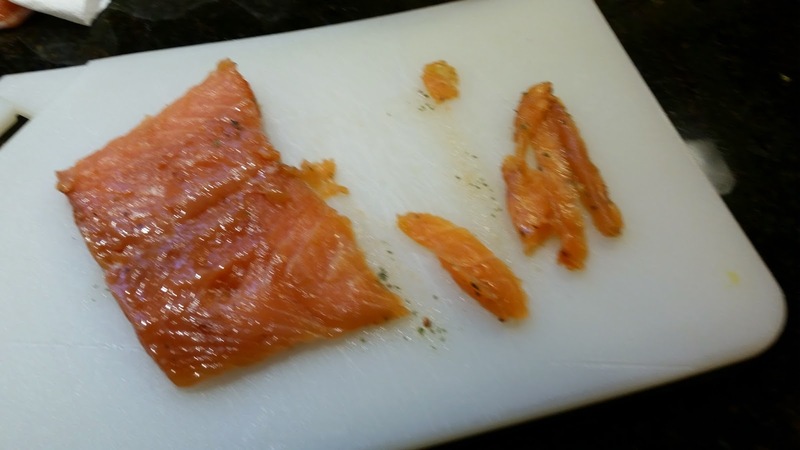 Place a piece of plastic wrap directly over salmon, and a second piece over baking dish. Weigh down salmon either by placing a cutting board (or piece of wood) that fits inside baking dish over salmon and placing a brick or several heavy cans on top of board. Or, Place large cans (such as 28 ounce cans of tomatoes), that cover most of the surface of the salmon, directly over plastic wrap. Refrigerate for 3 days. Remove weight and plastic wrap and flip salmon pieces once a day. When curing process is completed, remove the salmon from the baking dish and scrape off any spices. Rinse in cold water and pat dry. The finished salmon will keep for 2 to 3 days in the refrigerator, or you can seal it tightly in plastic wrap, or vacuum pack and freeze. To serve: Slice salmon very thinly holding a sharp knife at an angle, in the same direction as the white "zig zags" on the salmon. Tightly seal remaining salmon in plastic wrap.